The world needs the good news of the Gospel. But understanding the Gospel is impossible without understanding the cross of Christ — the event that turned the bad news of sin into the good news of salvation. 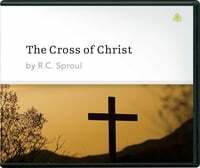 In The Cross of Christ, Dr. Sproul highlights humanity’s great need for salvation and communicates the way the cross fulfills that need. Offer valid through September 20th. Donate Now.